I have been exposed to a lot of techniques and approaches over my career and I have made a very conscious decision to primarily work in the ‘INTERACTIVE-VISUALS’ medium (meaning I use visuals and visuals to help facilitate reflection and decision making for groups and individuals). I’ve made this decision because working visually is so effective and rewarding. Brain researchers and learning specialists have identified that different people learn in different ways (called learning styles). 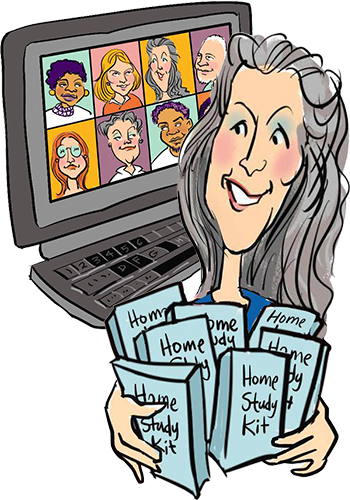 A learning style is the manner in which a person best receives and processes information. Most learners fall within one of more of the following styles: Auditory, Visual or Tactile. Auditory learners receive information best by listening; they tend to learn best during lecture and audio-based instruction. Visual learners tend to learn better when a variety of visual aids, such as blackboards, overhead projectors, and films, are used during instruction. They often use imagery to learn complex subjects. Tactile learners prefer to learn by doing. They usually learn best when they are allowed to use their hands and sense of touch to learn new information and apply new skills. An extension of this style is a “kinesthetic” learning style. Kinesthetic learners enjoy not only using their hands in the learning process but benefit from all types of physical movement while learning. The beauty of visual facilitation and visual coaching is that not only does it benefit visual learners (the vast majority of us) it also benefits kinesthetic (tactile) learners (by writing and filling templates out), and even auditory learners (if you share your work with others by talking, showing and explaining your maps to them). Using visuals in facilitation or coaching venues, while attractive and fun, are also deceptively simple learning tools that benefit ALL the types of learners. So much more user friendly than the majority of typical facilitation or coaching methods, which are almost exclusively auditory (the smallest group in the whole population!). 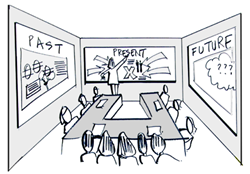 The wisdom, insights and aha’s of the group or individual are captured and written down in visuals and words, instead of flying off into thin air. The large visual displays act as a big mirror, helping people SEE what is going on inside of them, so they can objectively view their thinking and assumptions and make better, clearer, more informed conclusions and decisions — around their work, life or whatever it is they are focusing on. 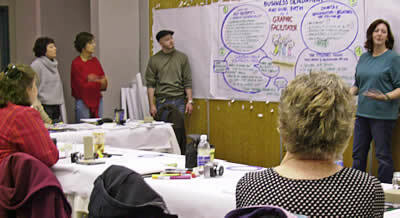 Visual Facilitation and Visual Coaching methods also tap into both sides of the brain (both logical and creative), using the best of both sides of a group’s or person’s personality and resources, instead of just being limited to one – as a result the level of thinking and the ability to handle complexity just sky-rockets. Another beauty of working visually: the documentation is created as you go. Now with digital cameras, scanning and photo editing programs, it is easy to create paper and electronic files of the displays that are created. Just take photos or scans of the charts and weave them into handy reports and PowerPoint presentations. This documentation helps you remember the process of your facilitation or coaching experience and the outcomes that were generated. So you can see and remember key concepts, ideas and breakthroughs as well as any dates or accountabilities that were addressed. 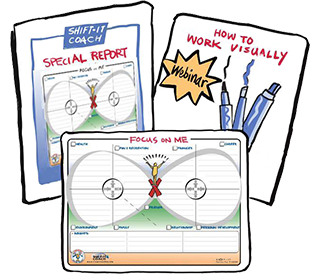 Also, since its all depicted in handy visuals, it makes sharing the material with others easy and enjoyable – like my visual coaching clients who share their personal visioning and planning maps with those close to them (family, friends, business colleagues, financial and other helping professionals). It’s not everyday that your clients get to see their thoughts and feelings written out in front of them with lots of color, formatting and images. Just walking into a room prepared for visual facilitation or visual coaching is a unique experience. Oh, and the skeptics that are won over by the end of day — the folks who come in thinking its all pretty pictures and not really getting it, who upon leaving, shake your hand and express their thanks and appreciations — another one won over to the power of working visually! Not only is visual facilitation and coaching a unique method, it is a very fun and enjoyable one to boot. Haven’t we all had enough of the typical, boring, stuffy, hard-to-keep-awake-and-on-track meetings and coaching sessions? Pull interactive-visuals into the room and you really hike up the energy and efficiency levels – helping people think out what they need to think out in a pleasurable and effective way. Proving that reflection work, whether done within a group or with just one person, can be fun as well as rewarding! Appeal to the Visual Thinkers in your own consulting, facilitation or coaching practice. Learn from my 17+ years experience (with corporations, not-for-profits and individual coaching) in the company of other like-minded people from around the globe via ‘The Fundamentals of Interactive-Visuals” … 3-day professional skills training. Or, book your own private training or in-house workshop. Learning customer chart work and visual facilitation. I still have such fond memories of attending last November and keep in touch with many of the other participants. I have been practicing my icon drawing and use this way of working with individuals coping with grief and loss. Through graphic facilitation, I help the client capture memories of their deceased loved ones in a visual way. They love the end result and I am amazed that it’s true: you don’t have to be an artist to share in this way! I’m wishing your next group a wonderful experience and know it will be so with your teaching style and the lovely landscape that is Victoria. As you say, “doodlers unite!”.